Born Boston, Massachusetts, July 3, 1738. Died London, England, September 9, 1815. John Singleton Copley was arguably the most artistically accomplished and financially successful portraitist in colonial America. He has long been recognized by art historians for his ability to render the distinct textures of hair, flesh, textiles, and other materials and to create the illusion of people and objects in space with dramatic contrasts of light and dark. Copley ingeniously synthesized that realism with fancy by borrowing settings, compositions, and costumes from seventeenth- and eighteenth-century English mezzotints.1 As a consequence of his artistic excellence, Copley achieved a level of success that enabled him to become the first American painter to live in a style and earn a social status comparable to that of his patrons. In America he created at least 273 oil portraits, fifty-eight pastels, thirty-seven miniatures, four history paintings, and one mezzotint between 1753 and 1774.2 That year Copley moved to London, where he adapted his portrait style to the more painterly British approach, shifted his emphasis from portraiture to history painting, and achieved international fame as an artist. Despite claims that Copley was not formally trained, he had more advantages as an aspiring artist than most of his American contemporaries. He spent three critical years of his youth from 1748 to 1751 in the home of his stepfather Peter Pelham (16951751), who was a London-trained engraver.3 As such, Copley probably received instruction in drawing, printmaking, and portraiture from Pelham, and was introduced by his stepfather to the English portrait prints that would serve him as valuable source material. Copley also had early exposure to two other English emigrant artists, John Smibert (16881751) and Joseph Blackburn (active 17521777), who respectively modeled the late-seventeenth-century Lely-Kneller baroque style and the mid-eighteenth-century rococo style.4 Smibert was active in Boston from 1729 to the mid-1740s when his health failed. Copley benefitted from seeing Smiberts paintings which included portraits and copies of Old Master paintings; Smibert also sold prints and art supplies. Joseph Blackburn was the most important and lasting influence upon Copleys artistic development. Blackburn, who arrived in Boston in 1755, is presumed to have trained in London as a drapery painter. Copley learned a number of rococo poses, compositions, and themes from Blackburns work. For instance, Copleys Ann Tyng (1756, Museum of Fine Arts, Boston) represents the sitter as a shepherdess in emulation of Blackburns Mary Sylvester (1754, The Metropolitan Museum of Art). In addition to adopting the pastoral theme from Blackburn, Copley also imitated the loose hair, stylized features, and shimmering textiles found in the English artists painting.8 Blackburn continued to have an impact on Copleys three-quarter-length portraits into the mid-1760s. 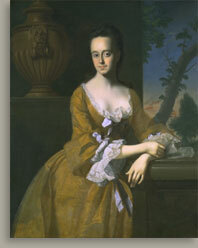 For instance, Copleys Margaret Gibbs Appleton (Mrs. Nathaniel Appleton) (1763, Harvard University, Cambridge, Mass.) is posed nearly identically to Blackburns Deborah Skinner Tasker (Mrs. John Tasker) (1756, location unknown). Each woman is seated with her right elbow propped on a table, her right hand pressed to her face, and her left hand in her lap, though Copley changed some of the props and adjusted the pose. Copleys Jane Browne (Mrs. Samuel Livermore) (1756, National Gallery of Art, Washington, D.C.) follows the oval, bust-length format exemplified by Blackburns Ruth Cunningham (Mrs. James Otis) (1755, location unknown).9 Copley would use a similar oval format and an approximately 30 x 25 inch canvas for at least fifteen bust- and half-length portraits between 1756 and about 1770. Figure 1. John Singleton Copley, Lucretia Chandler Murray (Mrs. John Murray), 1763, oil on canvas, 49 1/4 x 39 1/4 in. (125.1 x 99.7 cm), Worcester Art Museum, Bequest of H. Daland Chandler, 1969.37. Figure 2. 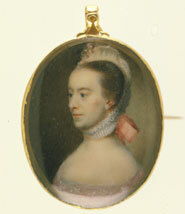 John Singleton Copley, Deborah Scollay Melville (Mrs. John Melville), about 1762, watercolor on ivory, 1 1/4 x 1 in. (3.2 x 2.5 cm), Worcester Art Museum, Museum purchase, 1917.184. Figure 3. 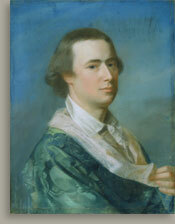 John Singleton Copley, Joseph Barrell, about 1767, pastel on cream laid paper, 23 3/8 x 18 1/8 in. (59.4 x 46 cm), Worcester Art Museum, Museum purchase, 1915.81. Figure 4. John Singleton Copley, John Bours, about 176062, oil on canvas, 50 1/4 x 40 1/8 in. (127.6 x 101.9 cm), Worcester Art Museum, Museum purchase from the bequest of Mrs. Hester Newton Wetherell, 1908.7. Oil paint was the dominant medium in Copleys career. In his early paintings he applied paint directly, whereas in the 1760s he used thin glazes to achieve luminous qualities in fabrics and flesh. Two excellent portraits painted with the direct technique are Epes Sargent (about 1760, National Gallery of Art, Washington, D.C.) and John Bours (fig. 4). Both portraits demonstrate that Copley had vastly improved his command of human anatomy by about 1760. Copley employed a relaxed posture in these two portraits to achieve very different effects. Whereas Sargent exudes confidence and a proprietary air, Bours is absorbed in thought. Copley used heavy impasto to convey the aged skin of Sargents prominently placed right hand, in contrast to his smoother application of paint to depict the much younger Bourss flesh. Copley soon achieved a reputation for capturing the elegance of his sitters, and his work rose in popularity among Bostons merchant class. The artists rising reputation may be measured in part by his increased productivity at this time; between 1763 and 1764 he painted at least forty-four oil portraits (16% of his total American output). Copleys many portraits of women in the mid-1760s reflect his continuing interest in the rococo style that Joseph Blackburn had introduced to Boston in 1755. By the time that Blackburn left for England in 1763, Copley had absorbed many of the English painters poses and, like Blackburn, had amassed a collection of imported contemporary mezzotints. Copley continued to develop a unique approach, however, individualizing his sitters likenesses in contrast to Blackburns method of generalizing his subjects features. Copley also developed a distinctive style of strong color and modeling, rather than borrow Blackburns softer palette and even light. Copley developed his portraits in this period with a combination of translucent glazes and opaque finishing brushstrokes. Figure 5. John Singleton Copley, Nathaniel Sparhawk, 1764, oil on canvas, 91 x 59 in. (231.1 x 149.9 cm), Museum of Fine Arts, Boston, Charles H. Bayley Picture and Painting Fund, 1983.595. Courtesy, Museum of Fine Arts, Boston. Reproduced with permission. © 2000 Museum of Fine Arts, Boston. All Rights Reserved. 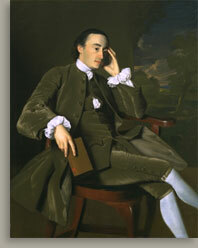 In 1764 Copley painted his first full-length portrait, Nathaniel Sparhawk (fig. 5), which relates loosely to paintings done between 1745 and 1750 by Smibert and Feke of the heroes of the British invasion of the French at Louisbourg.26 Copley surpassed those models with his strong color scheme (red and white against brown and blue), relaxed pose of the figure, and facility at reproducing the texture of the fabrics. Copleys next full-length was a posthumous portrait of Thomas Hancock (about 176466, Harvard University, Cambridge, Mass. ), which was commissioned by the sitters nephew John Hancock to hang at Harvard.27 Such commissions were rare, since large canvases were impractical in most domestic interiors and few public institutions existed to preserve the likenesses of their leaders. Copley subsequently painted two more full-lengths of Harvard benefactors: Thomas Hollis (1766) and Nicholas Boylston (1773, both at Harvard University, Cambridge, Mass.). Figure 6. John Singleton Copley, Paul Revere, 1768, oil on canvas, 35 1/8 x 28 1/2 in. (89.2 x 72.4 cm), Museum of Fine Arts, Boston, Gift of Joseph W. Revere, William B. Revere, and Edward H.R. Revere, 30.781. Courtesy, Museum of Fine Arts, Boston. Reproduced with permission. © 2000 Museum of Fine Arts, Boston. All Rights Reserved. In 1769 Copley married Susanna Farnham Clarke who was the daughter of Richard Clarke, one of Bostons prominent merchants. Gaining in wealth and social standing, Copley moved to Beacon Street near John Hancock and other politically influential men.33 In the same year as his marriage, Copley created his first known self-portraits: a pastel (Winterthur Museum, Winterthur, Delaware) and a miniature replica in watercolor on ivory (private collection). Those portraits show Copley elegantly dressed as a gentleman with powdered hair and brilliantly colored clothes. Both artistically and socially, the self-portraits announce that Copley had attained a new level of prestige. Copleys most ambitious self-portrait, The Copley Family (177677, National Gallery of Art, Washington, D.C.), was painted in England and also portrays his wife, his father-in-law, and four of his six children. Copley traveled to New York in 1771, where he created as many as thirty-seven portraits in just seven months.34 That trip was prompted by a commission in 1768 for a portrait of the Reverend Myles Cooper (Columbia University, New York), who was president of Kings College, now Columbia University. 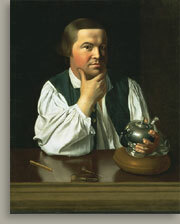 After Cooper sat for his portrait in Boston, he encouraged Copley to make a painting trip to New York. Captain Stephen Kemble arranged for a number of subscriptions to ensure Copley a steady stream of business in New York. His patrons there tended to belong to the Anglican church and maintain Loyalist political positions, in contrast to his religiously and politically diverse clients in Boston.35 Copley also ventured briefly to Philadelphia during that trip. In 1769 Copley had traveled to Portsmouth, New Hampshire to fulfill a commission for a pastel portrait of Governor John Wentworth; the total number of such short trips remains unknown.36 Copley enjoyed patronage from sitters in Gloucester, Marblehead, Newburyport, and Salem, Massachusetts as well as from clients in New Hampshire, Maine, and Rhode Island, though many of those portraits are thought (or known) to have been painted in Boston. Tories and Whigs alike patronized Copley in Boston. Among Copleys Tory patrons was General Thomas Gage, the commander in chief of British forces in North America and the last royally appointed governor of Massachusetts (about 176869, Yale Center for British Art, New Haven). With commissions to paint the likes of Adams and Gage, it is not surprising that Copley would write to Benjamin West in 1770, "I am desireous of avoideing every imputation of party spir[it], Political contests being neighther pleasing to an artist or advantageous to the Art itself. . . ."38 However, as the likelihood of military conflict grew, Copley was no longer able to maintain political neutrality. With past encouragement from the British artistic elite pulling him to London and current political pressures pushing him from Boston, Copley sailed for England on June 10, 1774. His wife and children joined him in London in 1775. Before settling in London, Copley followed Wests advice and traveled through France and Italy. He spent the remainder of his career in England, painting more multi-figure portraits and history paintings than he had in America. His style became more painterly and his poses more active. West, who had been his mentor, became his rival. For instance, in 1792 they competed against each other for the presidency of the Royal Academy but West prevailed. Figure 7. John Singleton Copley, Death of Major Pierson, 178284, oil on canvas, 97 x 144 in. (246.4 x 365.8 cm), Tate Gallery, London. Copley earned a wide audience, critical success, and great wealth in London from his history paintings. The first major success in this vein was his Watson and the Shark (1778, two versions, National Gallery of Art, Washington, D.C. and Museum of Fine Arts Boston), which was displayed at the Royal Academy to acclaim. That canvas depicts the moment in which a ships crew rescues the young Watson from the jaws of an attacking shark. Copley had been elected an associate member of the Royal Academy in 1776, and Watson and the Shark earned him full membership in 1779.39 Copleys next history painting, Death of the Earl of Chatham (177981, Tate Gallery, London), represents the dramatic moment at which Chathamwho was sympathetic to the American political causewas overcome by a stroke during a Parliamentary debate.40 Because of its politically charged subject, the painting created a public sensation and again Copley received critical praise. By exhibiting the painting for an admission fee, Copley earned a substantial income from the painting. Despite its acclaim, Copley was unable to sell the painting at an appropriate price and in 1806 sold it by a lottery that garnered two thousand pounds for the artist. 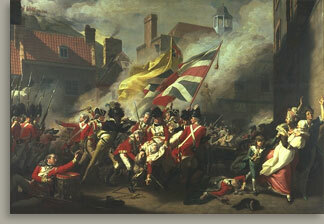 Copleys third major success at history painting was his patriotic Death of Major Pierson (fig. 7), which shows the untimely demise of an English officer killed by French invaders of the island of Jersey.41 In keeping with the academic method, Copley made numerous drawings and oil studies in preparation for these large, complex, multi-figure compositions. As in his American portraits, Copleys English history paintings combined strong likenesses with compositions borrowed from European prints. Through knowledge gained in the course of his travels, Copley was also able to quote from the Old Masters in his history paintings. 1. Lovell 1998, 47 and 39. 2. This count of Copleys works is based on the checklist published in Prown 1966, I, 20536. Unlocated and destroyed portraits are counted as oils unless they were clearly created in another medium. Replicas by Copley are included in the count, whereas attributed pictures are not. The counts are augmented by one oil painting, three miniatures, and one pastel listed in Rebora 1995. 3. Prown 1966, I, 910. 5. Ibid., I, 1114 and 2022. 8. Ibid., I, 22 and Staiti 1995, 17677. 9. Bolton and Binsse 1930a, 50 and Prown 1966, I, 23. 10. Rebora 1995, 16668. Copleys The Forge of Vulcan is a copy of an engraving by Nicholas Tardieu after Charles-Antoine Coypel. 11. Carol Troyen, "Moses Gill," in Ibid., 20001. 12. Sweet 1951, 153; Fairbrother 1981, 123; and Lovell 1998, 2122. 13. Prown 1966, I, 60; and Ribeiro 1995, 10809. 14. Prown 1966, I, 29. 15. Erica E. Hirshler, "Reverend Samuel Fayerweather," in Rebora 1995, 192. 18. Hirshler 1995, 117 and 121. 22. Ibid., 132 and 133. 23. Prown 1966, I, 36 and 57. 25. Prown 1966, I, 67. 26. Ibid., I, 4142; and Miles 1983. 28. Reported to Copley in a letter from Captain R. G. Bruce, August 4, 1766, whom Copley intrusted with the painting, as quoted in Ibid, I, 48. 31. Ibid., I, 78 and 80. 37. Ibid., I, 8384; and Carol Troyen, "Samuel Adams," in Rebora 1995, 27580. 38. Quoted in Prown 1966, I, 78. Copley was writing about a specific paintingWilkes Barber (1770, location unknown)but the letter also conveys the artists broader approach to the political turmoil of the day.